We’ve all been there—barely surviving the morning rush hour of making lunches, signing permission slips, and searching for matching socks. Then after a busy day at work and school comes the evening whirlwind of homework, dinner, and maybe a few minutes of downtime. That leaves most of us with no time to keep our home tidy, much less clean. But if your New Year’s resolution is to have a house that doesn’t send you into a shame spiral when friends drop by, read on for our dirty ... er, clean dozen: simple, quick habits that will make it look like someone slaved over your house all day. Face it: There’s no way you’re going to trek downstairs to grab some cleaner to wipe off that toothpaste glob; you’re going to leave it there until it hardens into cement. That’s why Laura Smith, founder of All Star Cleaning Services, keeps a spray bottle of all-purpose cleaner and a stack of cleaning cloths under all her sinks in the bathrooms and kitchen, so she can wipe up any little spot or spill she sees before it becomes a big mess that requires elbow grease—and time. You’re standing there rinsing your hair, so why not do a once-over of the shower walls? Smith finds one of the best products for keeping the shower clean is natural dish soap, because it is designed to fight grease—which, surprise, is mostly what’s in the soap scum lining your shower walls! “Give the walls a quick once-over with soap and a sponge a couple of times a week, then use the showerhead to rinse, and continue on with your shower," she says. And always wipe down those glass doors when you are finished to keep streaks at bay. This is the best way to avoid a huge headache at the end of a meal, which you know you’re going to want to walk away and leave, says Janice Stewart of Castle Keepers House Cleaning. Even if you need to keep both eyes on the burners, at least fill your sink with soapy water and stick the pots, pans, utensils, and other cooking items in to soak while you eat. “Train your whole family to put dishes directly in the dishwasher, which keeps the sink clean and the counters clutter-free,” Smith says. “Flat surfaces collect clutter like a paperclip to a magnet,” says Jessica Samson, spokesperson at The Maids. They’re also what you see as you scan the room, so when you have clutter on flat surfaces it seems like it goes on forever. “The more you can keep tables, floors, beds, and countertops clear, the cleaner and more spacious these areas feel,” she says. The biggest clutter culprit is paper, so don’t let it pile up. Recycle unnecessary mail the minute it comes in, and create a filing system for the rest of it. Grab those sad celery stalks that you were so sure you were going to stir-fry and those takeout leftovers that never made it to the office, and trash them before they rot and leave a lingering order, advises Dawna Boone, owner of Valet Maids. Always put things back in their proper place after every use, says professional organizer Paloma Baillie. Ditto for scissors, pens, and all those wayward objects that should have a designated spot in the junk drawer, as well as shoes, umbrellas, and coats that need dedicated hooks and bins to keep the entryway pristine. For those things that weren’t part of suggestions 8 and 9, make a nightly pickup part of your routine, advocates Devoreaux Walton, a lifestyle expert at The Modern Lady. Set aside just 10 to 15 minutes every night—put on music if it makes the process more fun—and return everything to its spot, from toys to magazines. If you have a few minutes left over, run a cleaning cloth over counters or do a quick sweep, devoting five minutes to a different area every night. This is more of a long-term solution, because less stuff means less to clean and organize. Use what Baillie calls her “three-bucket method,” where you keep buckets or bins handy to deal with items on an ongoing basis. “Trash it if it’s worn out or broken; donate it if you no longer need it, but it’s otherwise usable; sell it if it’s in good condition,” she says. If it’s hard to part with certain items, Samson recommends moving them at least temporarily to a box in the attic or a storage space. You'll find it easier to keep up with laundry and closet organization when you have less stuff. This might seem like cheating, but it’s really not. “It is absolutely the best money you can spend if you want to keep a clean home but have pets or small children,” Smith says. 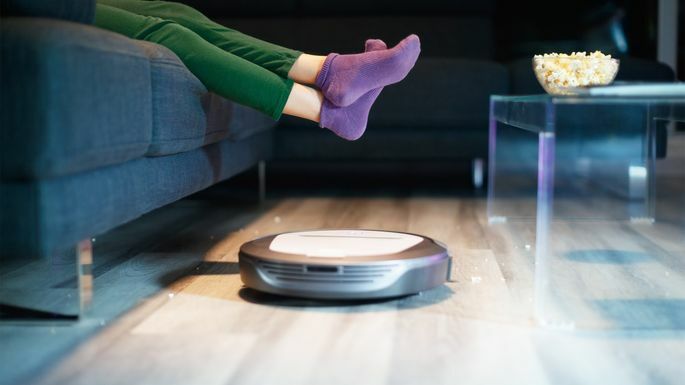 She recommends programming it to run daily while you are at work, or overnight—and then you can enjoy clean floors without lifting a finger.